Christ promises to always be with us, and this white gold cross pendant from Apples of Gold is a wonderful way to honor that commitment. The cross pendant is made of the highest quality 14K white gold, making it a slightly modern take on the traditional cross. This design is free from complicated design and leaves unwanted embellishments behind, creating a simplistic but powerful emblem of faith. The arms of the cross are proportioned perfectly for the ideal cross shape and make this polished piece a must have for any occasion. 22mm x 14mm (7/8" x 9/16"). 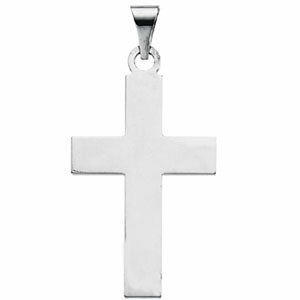 We guarantee our Polished Plain Cross Pendant in 14K White Gold to be high quality, authentic jewelry, as described above.